I just read on your website that you pay your translators per hour, rather than per word. What does that mean for me as a client? Interlex is fairly unique in that we pay our translators and charge our clients by the hour, instead of charging per word which is what most agencies do. This has some major benefits for our clients. If you often have texts with the same terminology, they will become cheaper as time goes on because the translators will become quicker at translating that terminology. Most of our customers have chosen to pay per hour. This has the added benefit that if you send us texts with a lot of repeats, or texts that are similar to previous texts, these will be cheaper because the translator will not need as long. If you prefer to pay a per-word rate then that is also fine. Do you work with translation software? it puts the source text into one column and allows the translator to type their translation into another column. 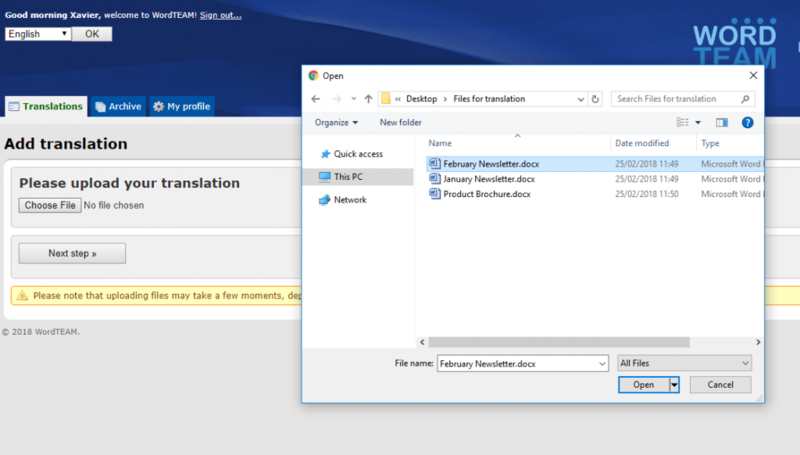 This is much easier and more practical than translating in a Word document, it makes the work easier and it means the translator will never accidently skip a word or a line. the software remembers earlier translations, so when a certain term or sentence comes back in a new translation, the translator does not have to translate it again. Translation software is NOT the same as automatic machine translation, such as Google translate. At Interlex Language Services we NEVER use machine translation. Right, now that we have addressed that frequent misunderstanding, we can answer the question: almost all our translators use translation software. When needed, we sill send a translation job to the same translator who did a previous similar one, because that translator has built up a translation memory. That means the translation will be quicker and therefore cheaper. If that translator isn’t available, and the translation is urgent, we will ask him or her to supply us with the translation memory. That way the new translator can use it and will also be fast and they will use the same terminology. What do you mean with creative translation? Dry translation - for example translations of technical manuals, legal and medical texts. It isn’t important that the translation sounds great, it just needs to be a clear translation of the source text. Creative translations - for example translations for marketing and literature. These should not only be a translation, but they should also sound good, run smoothly and be right for the target audience. That last bit is called localisation. That’s when a text is adapted to the target audience in a certain country. For example, a French translator might change the sentence “a typical breakfast with a bowl of cornflakes” to “a typical breakfast with a croissant” and a Dutch translator may change it to “a typical breakfast with a cheese sandwich”. Because otherwise it would not be a typical breakfast for the readers in those countries! Transcreation - for example slogans, scripts, poetry and lyrics. Here a translator almost ceases to be a translator, and becomes an artist. Interlex is specialised in the second group, creative translations. We will try our hand at transcreation every now and then, too. We’ll ask our most talented translators for this, because it really is a craft. We don’t do dry translations, we prefer to leave that to others! We have our own system that we would like translators to log into and work in. Is that possible? Sure. Please contact us and we can talk about it. How do I upload a file for translation? WordTEAM is Interlex’s clever workflow system that saves us time, which means it saves you money! 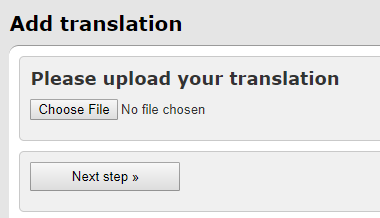 Simply click the button “Add translation” to upload a file for translation. Clicking “choose file” will open up the file explorer on your computer, where you can find and choose the document you would like to have translated. 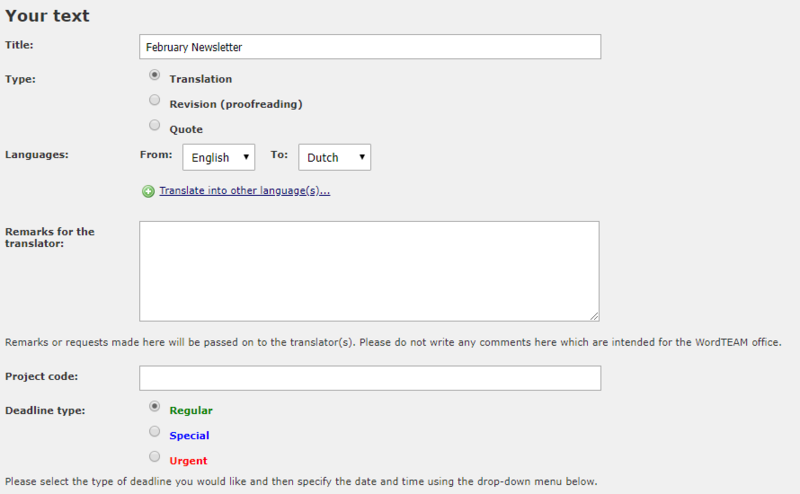 Clicking “Next step” will bring you to the following page, where you can fill in some details about your translation. There are some details we need to be able to process your translation, such as the source and target language and the deadline. There are also some details that you can fill in for your own convenience, if you need a PO code to be mentioned on the invoice, for example, this is the place to note that code down, and if you have a special request or remark for the translator, this can also be written down here. If you do not have a project code, you can just leave this field blank. The same goes for the “Remarks for the translator” field. When you have filled in all the necessary details, you will be asked to accept our terms and conditions. Once you have done that, just click “send”. Your document will be picked up by our project manager asap who will look at it and decide on the best translator to send it to. I have one file that needs to be translated into multiple languages, is that possible? If you have one file that needs to be translated into multiple languages, WordTEAM makes this very easy. 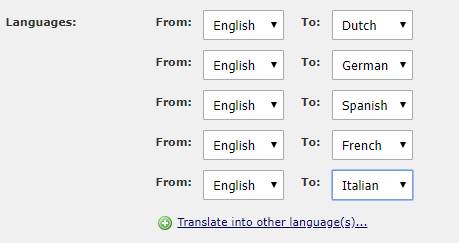 You only have to upload the source file once, and note all the languages it needs to be translated into. WordTEAM is asking for a project code, but I don’t have one! That’s fine, you can just leave the field blank. Some companies have project codes that need to go on the invoice for their translations, which is why we created this field. But if you do not have a project code, that is no problem at all. At my company, multiple people will be uploading translations, is that possible? Yes, but you will have to decide how you want to handle it. The easiest course of action (and the one we recommend for optimum security) is to give each person their own account on WordTEAM. However, some companies opt not to do this because it means there is no central control at their end over who uploads what. Some clients instead opt to have one shared account for all colleagues, and everyone who uploads a text notes down their name in the remarks field. This way it is clear within the company who has uploaded what and, if you wish, our invoice will note the name of the person who uploaded the text per text. Other clients have opted to make one person at their office responsible for collecting and uploading all translations. If you would like to discuss this matter with us please don’t hesitate to contact us. We can advise you based on your needs and our experience. I need a translation urgently, what is your quickest deadline? Our quickest deadline is one working day. Our system works with three cut-off points per day, at 9:00, 12:00 and 17:00 hours. So if you upload a translation before nine a.m. on a Monday, and you specify the most urgent deadline, we the quickest you can get it back is before nine a.m. on Tuesday. You can always add a note to ask if even quicker is possible, and for very short texts this often is. Is WordTEAM available in other languages? Yes, WordTEAM is available in English, Dutch, German and French. Switching the language is really easy with the drop-down menu in the upper right-hand corner. Does a translated text remain available after I have downloaded it? Yes, a text will remain available under the “translations” tab for about two weeks. After that it will be archived - we do this so that your list of translations doesn’t become too full and cluttered - and you will be able to find it and download it under the “Archive” tab for six months. Yes, WordTEAM runs on an https server and is completely secure. Your texts can only be accessed by you, by the translator translating your text, and by our admins. All our translators have agreed to our Working Agreement which includes a confidentiality clause. Will my text be handled confidentially? Yes, all our translators and project managers have agreed to our Working Agreement which includes a confidentiality clause. Can I send you a document via e-mail instead? Yes, but we will charge you 5% extra if you do this, because it will cost us more manual work. WordTEAM saves us on overhead costs and therefore allows us to charge our clients a lower price. If you send us a text via e-mail you will also not be making use of the fact that WordTEAM runs on a secured HTTPS server. Sending texts via e-mail is less secure. Can I check the status of my translation? Yes, when you log into WordTEAM you will be able to see what is happening with your translation right now. How do I sign up for WordTEAM? Registering takes only a minute or two. Which details do I have to give when I sign up to WordTEAM as a client? Very few. Here is a screenshot of the registration page. Can I change my details after I have registered with WordTEAM? Yes, you can change everything except your user name. Changes can be made under the “My profile” tab. Automatic e-mails (such as the e-mail alerting you that a translation is finished) are sent to the e-mail address that you filled in, and this can also be changed at any time. You will not get an automatic e-mail to confirm the change, but the details you see written in WordTEAM are the details we have. If your change of details involves your invoicing details we would ask you to also send a quick e-mail to accounts@interlex.eu. If you would like to change your username we recommend you register with a new account. Interlex is different from most other translation companies in that we pay our translators and charge our clients by the hour, instead of charging per word which is what most agencies do. This has some major benefits for our clients. If you often have texts with the same terminology, they will become cheaper as time goes on because the translators will become quicker at translating that terminology. Most of our customers have chosen to pay per hour. This has the added benefit that if you send us texts with a lot of repeats, or texts that are similar to previous texts, these will be cheaper because the translator will not need as long. If you prefer to pay a per-word rate then that is also possible. Our hourly rate is EUR 70. If you are planning to send us regular work, we can talk about a discount. Please contact us if you would like to discuss this. What is your minimum charge for a short translation? Our minimum charge for a short translation is 10 minutes. We feel this is fair because a translator has to download the text, open the document, type the translation and send the document back, then the project manager has to download the translation, check that it is correct and what the client asked for, and send it back. Even if the translation is only a few words, all of this still takes time. Our normal hourly rate is EUR 70, so 10 minutes works out to EUR 11.67 (excluding VAT). If you are planning to send us regular work we can talk about a discount and a lower minimum charge. Please contact us if you would like to discuss this. It is the evening/ weekend but I have an urgent question, can I reach you?